Just Jingle: Stampendous! is having fun with Shaped Cards! Have you checked out the new challenge with the Stampendous team this month! Each Saturday in March, we'll be challenging ourselves (and you!) to make a shaped card or project - something other than the traditional square or rectangular card. Doesn't that sound like fun? Here is the card I created for this week! 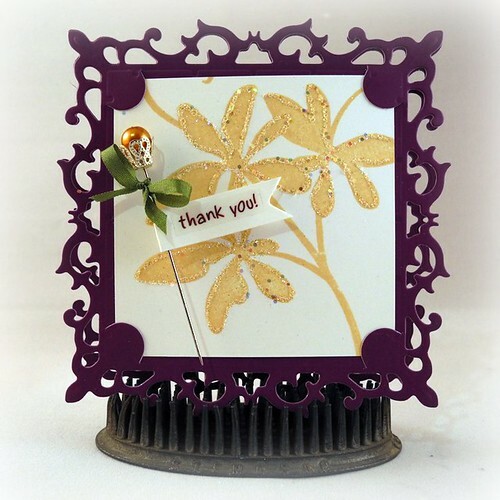 I used my Grand Calibur to cut the card shape and then stamped the gorgeous flower from the Cling Jumbo Thank you set on a white panel and added a bit of glorious crystal glitter from the Treasures Glitter Kit to make it sparkle! A simple stick pin with some May Arts silk ribbon and a quick sentiment banner made with cardstock and a sticker from SRM finishes it off! really pretty...love the striking colors! happy saturday! lovely card Jingle~love how you photographed it!!! Wow, beautiful card! Love it!! Gorgeous edges! Love the beautiful pin, too. This is a beautiful card-really like the added touch of the pin, just lovely! wow this is GORGEOUS....what a lovely design..
Now that is a great shape! This is simply amazing, Jingle!! Gorgeous card - I love the fancy die cut! Great idea to make "different" shaped cards! !